A head and shoulders portrait of Bonnie Prince Charlie can be seen reflected at the bottom of the reflective cylinder. Holbein's painting 'The Ambassadors' showing the anormorphosis skull. Click to find out more about it. Curved ceiling of the Church of Saint Ignazio in Rome, painted by Andrea Pozzo. Everyone gathered to see what was so fascinating about this particular piece of art. It was unlike anything they had ever seen before. The artist’s image had a hidden aura about it and people were captivated. The artist behind this art form was Hans Holbein, the Younger who painted The Ambassadors, displayed in London’s National Gallery. The acclaimed artist hid a distorted skull inside the painting that people could only make out if viewed from a certain angle. Artists called this art form anamorphosis, the art of concealing images within a deformed painting. Later in history, this art form would expose the world to the Secret Portrait of Bonnie Prince Charlie. Art lovers would tell you that it is the artist’s way of getting intimate with viewers. However, not everyone can tell what message the artist is trying to portray through his painting, as it’s distorted. In fact, most people, during that era, used special devices to view the image more closely. Most importantly, people used anamorphosis to deliver secret messages from person to person. Rebellion, allegiance to the opposition, and standing up against the current regime was done in secrecy amongst a group of individuals sworn to protect the cause. This was hugely popular in the Renaissance era where officials forbid people to indulge in any form of sorcery or dark arts. Furthermore, artists came up with two ways to express their creativity. One of them was widely used by people, perspective (oblique) and mirror (catoptric). Oblique anamorphosis creates an unconventional image, which the viewer can’t view unless specifically told to from a certain position. A famous example of this technique is on the curved ceiling of the Church of Saint Ignazio in Rome, painted by Andrea Pozzo. Through the painting he depicted Saint Ignatius descending into heaven. Soon after, artists began using a different technique to depict images, the distorted technique called mirror anamorphosis. Mirror anamorphosis transforms a flat deformed picture into a three-dimensional picture using a cylindrical mirror placed on the drawing. Therefore, artists began to paint pictures that couldn’t be viewed with a naked eye, but were only viewable with the help of a mirror. This technique swept through England in 1746, the time of Bonnie Prince Charlie. Charles Edward Stuart or better known as Bonnie Prince Charlie led the Jacobite uprising in 1745. His motivation behind the uprising was to regain the throne of Britain for his family. However, he was defeated at the Battle of Culloden, thus putting an end to the Jacobite cause. Even though he lost, there was one good thing that came out of the cause—the Secret Portrait of Bonnie Prince Charlie. After his loss, people couldn’t support the Jacobite cause openly and if caught, could be charged with treason so they did in the privacy of their homes. Prince Charles friends and loyal followers of the movement used a painting created via anamorphosis to show their support. The artist, whose identity remains unknown to this day, concealed the Prince’s image in the painting, which the artist drew on a tray. In order to see the image of Prince Charles, the followers placed a goblet on the tray, and saw his image reflected on it. If you ever come across an anamorphosis-styled painting, tilt your head, close one eye, and move closer to the picture, and then you may see the real meaning behind the painting. When you stare at the picture for about ten seconds you eyes adjust to this negative image and then the picture changes to black and white but you don't see it as black and white you see it in full color. Amazing! Have you ever seen an optical illusion? Of course you have you're on Optical spy. 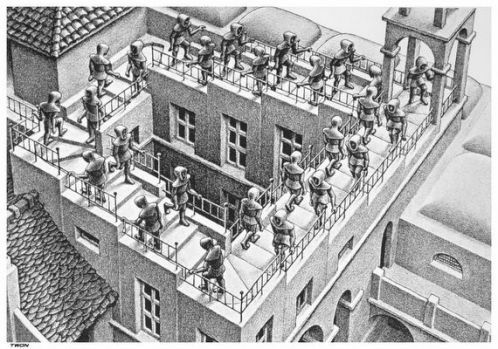 Maybe an image of never-ending stairs that seem to merge into one another at different angles and all lead to the same way, over and over again! Most optical illusions are tricks of the mind and depend upon how you perceive the image you are seeing. An optical illusion is an occurrence where you perceive and see an image that is an illusion; you see a virtual reality that exists only in your mind. In general, optical illusions are of three types, but here, we will discuss only the physiological illusions that occur as physical responses of the eye’s exposure to light, and other stimuli. When we look at a bright light bulb for a long period of time and then look away at a dark surface, we can clearly see the imprint of the light bulb in front of our eyes. This is the physiological illusion that our eyes create when they are over exposed to the stimuli of lights. Thus, all such after-images that flood our vision after our eyes have been stimulated with a stimulus, are known as physiological illusions. Physiological illusions are caused by a wide variety of stimuli, out of which the most common ones are brightness, movement, tilt, color, position, and size. These stimuli send messages to the brain and create an impact that can be seen even when you have taken your eyes off the image itself. Just like the bright after images seen after staring at a light source for long durations, similarly, even starting at a pattern can cause you to visualize it in continuous succession even when you have stopped looking at the image itself. The theoretical reasoning behind physiological illusions is that certain images send stimuli to our brain using fixed neural paths. Thus, when you continue to stare at the image for a longer duration, your eyes are repeatedly receiving stimuli from the image that is being transmitted to the brain via the same neural path over and over again. This is what creates a pattern or imprint in front of your eyes and hence, when you remove the image from your line of vision, you can still see it in front of your eyes. A physiological illusion is thus, considered to be a physiological imbalance that actually alters and changes your perception, making you see images that are not present in front of you. You can even see the physiological illusion when you close your eyes as the world becomes dark behind your eyelids. As most techniques of illusions, physiological illusions are also greatly used within the works of art of various past artists. People from many genres and styles of painting have made the most of illusion artwork by creating images that stimulate the eye and create long lasting illusions. The use of bright colors and alternating patterns helps these talented individuals in creating vivid pictures that come alive in people’s eyes with the help of a physiological illusion. The architects of the Parthenon adjusted the plans so that the major lines of any significant building are rarely straight. The most obvious adjustment is to the profile of columns, which narrow from base to top. However, the narrowing is not regular, but gently curved so that each columns appears to have a slight swelling, called entasis below the middle. But this entasis is never so pronounced as to make the swelling wider than the base; it is controlled by a slight reduction in the rate of decrease of diameter. Optical illusions are everywhere, and in this digital era, we see skilled photographers using amazing cameras techniques and equipment to shoot photos that are modifying the scales of two objects, making one smaller than the other; to create an amazing whole picture. However, do you know what this camera technique is called and what is its origin? Find out more below. The technique of forcing people to perceive objects in a different manner than is possible in reality is actually an art form known as 'forced perspective'. The technique of forced perspective has been around for quite a while and has been used throughout history by various artists to make their work come to life and become truly unique. The trick behind this art form is to scale objects to different sizes so that a sense of depth can be created and perceived within the paintings. Forced perspective plays with the visual perception of humans and creates an optical illusion that is life-like, making it seem like reality. Employing forced perspective, an artist can make objects seem larger, smaller, nearer, or farther than they truly are, creating an illusion within a picture. For instance, two people of equal height may be depicted at varying depths in the canvas; making one seem taller and closer than the other. Additionally, the use of forced perspective can also merge two objects with each other within a picture or bend the laws of gravity to show people walking on the surface of water or sitting on air. Although forced perspective does not create the illusion of three-dimensional objects, it is still a highly used art form that has been able to trick people into believing impossible occurrences and pictures. However, art is not the only way to display the technique of forced perspective. Filmmaking, photography, architecture, and art, all have an equal share in the development of this technique. Forced perspective is a form that was commonly used by the Greeks in architecture. Simply by creating their columns to be narrower at the top rather than at the bottom, allowed them to provide the illusion of a higher and vast space to their structures. This technique is also used in theatres today to depict a larger space in the interior. As mentioned previously, in spite of the wide use of forced perspective in art forms over time, today, the technique is being used in photography and films to create optical illusions that are unbelievable. Forced perspective as an art is clearly seen in historically famous paintings, where it creates believable illusions. This technique, though modified continues in today’s world, fooling people into believing in the impossible. The film premièred at the 2013 Toronto International Film Festival and was released in limited theatrical release in the United States by Sony Pictures Classics on January 31, 2014. Tim's Vermeer has been met with positive reviews from critics. On Rotten Tomatoes, the film holds a rating of 89% based on 107 reviews, with the consensus reading: "Entertaining and profound in equal measure, Tim's Vermeer uses its seemingly esoteric subject to pose fascinating questions about art and obsession". On Metacritic, the film has a score of 76 out of 100, based on 32 critics, indicating "generally favorable" reviews. Tim's Vermeer alongside Vermeer's original. Remember Tim's painting isn't a copy of the original. It is a copy of how Tim and others, including David Hockney, think Vermeer painted using optics similar to the Camera Obscura an added mirror. The Ambassadors (1533) is a painting by Hans Holbein the Younger in the National Gallery, London. As well as being a double portrait, the painting contains a still life of several meticulously rendered objects, the meaning of which is the cause of much debate. It is also a much-cited example of anamorphosis in painting. The most notable and famous of Holbein's symbols in the work, however, is the distorted skull which is placed in the bottom center of the composition. The skull, rendered in anamorphic perspective, another invention of the Early Renaissance, is meant to be a visual puzzle as the viewer must approach the painting nearly from the side to see the form morph into an accurate rendering of a human skull. While the skull is evidently intended as a vanitas or memento mori, it is unclear why Holbein gave it such prominence in this painting. One possibility is that this painting represents three levels: the heavens (as portrayed by the astrolabe and other objects on the upper shelf), the living world (as evidenced by books and a musical instrument on the lower shelf), and death (signified by the skull). It has also been hypothesized that the painting is meant to hang in a stairwell, so that persons walking up the stairs and passing the painting on their left would be startled by the appearance of the skull. A further possibility is that Holbein simply wished to show off his ability with the technique in order to secure future commissions. Illusion is a step away from reality and optical illusions are those that relate images we see to others that we visualize, perceive, or relate to. 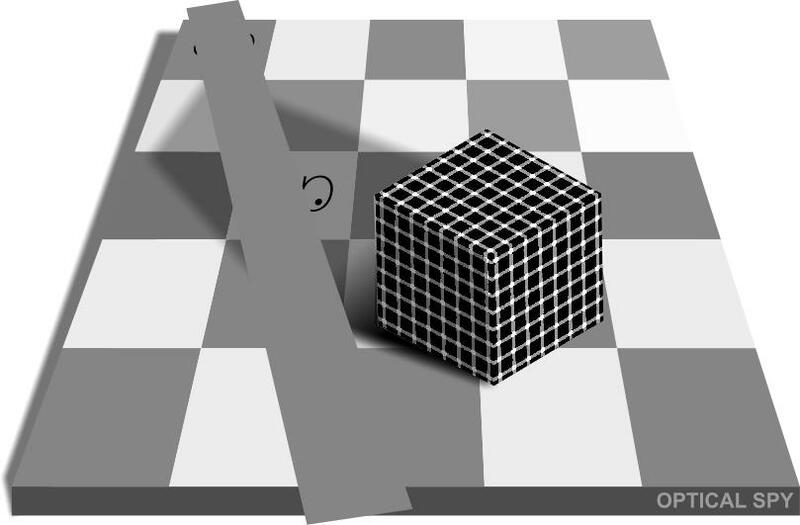 Although there are three major types of optical illusions, cognitive illusions remain the most researched amongst them all. So what are cognitive illusions? In life, we gain awareness and consciousness about many different subjects, changing the way we perceive our world. A cognitive illusion occurs when our mind relates anything that we are observing to another object that relates to it and is present within our subconscious. Thus, the image sparks our subconscious mind and brings forward a relatable perception into the conscious one, allowing us to use our assumptions about the world to create unconscious inferences about what we see in front of us. The concept of unconscious inferences was first suggested by a German physician and physicist named Hermann Helmholtz in the 19th century. Rather than physically perceiving an object, we mentally create ideas and perceptions about it and this is a cognitive illusion, that we infer and understand what has not truly been explained in front of us. There are many images that may be perceived differently if they are seen from different angels or if they are seen in black and white without any colors. For all of these images, your perception will continue to switch and change with the way the image is presented to you, thus, making the actual object into an illusion that is perceived differently every time. The ambiguity of the image is what causes the illusion. When you are able to perceive the same image differently due to a distortion of its size, curve, length, or position, it is known as a distorting illusion. These illusions occur when the physical aspect of the image is modified, making you change your perception entirely. The illusion however, is not caused by a change in the dimensions of the image. Rather, the fact that you can see a change is the illusion itself, as the image remains constant but you perceive its dimensions to be ever changing rather than remaining constant. Paradox illusions are generated by images that are completely paradoxical or impossible in reality. The illusion is in the fact that they contradict reality, and are generated by objects that appear life like and three-dimensional within a two dimensional image. The images themselves are convincing enough, but are still impossible within the bounds of reality. Fictional illusions are those that are not actually created but are perceived by one individual. These illusions are also called hallucinations and can be induced due to schizophrenia or a hallucinogen. In these illusions, the observer sees images that are not even present in front of him or her, and these images are seen by the observer alone, without the presence of an actual stimulus. Our brain is continuously trying to relate whatever information is in our minds with whatever we are observing in the world around us and this is why we are sometimes able to see images and perceive concepts that are not even a part of our reality.